Throughout my life, I have always looked forward to noodle kugel. I love the crunchy noodles that toast up on top. For many years, I would only eat the crunchy noodles, decimating the kugel for anyone else who cared to enjoy it. Now, I like the whole thing, but the crunchy noodles and the sweet onions are still my favorites. To make this kugel, dice 2 onions. 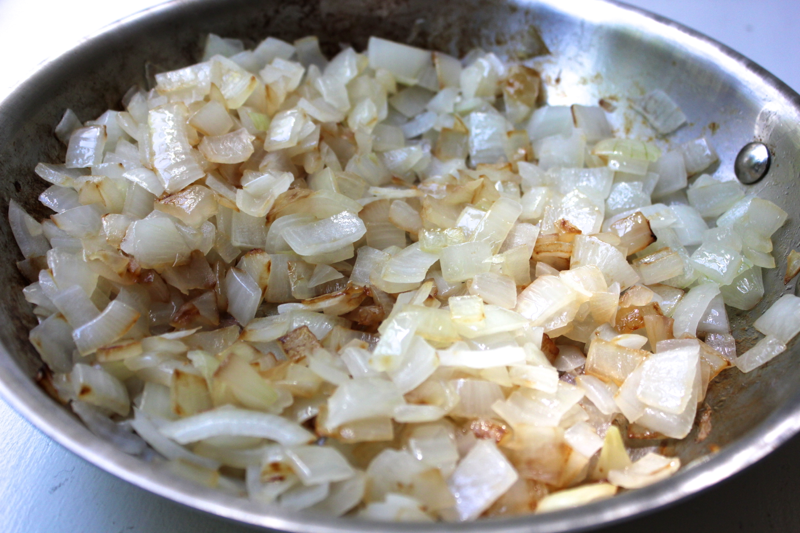 Heat 1-2 tablespoons of vegetable oil in a pan, and fry the onions until they begin to brown. They get so sweet and savory that it takes self-control to keep from eating them all! Also cook 1 pound of egg noodles in salted water until they are al dente. Drain the noodles, and run them under cold water to stop them from over-cooking. 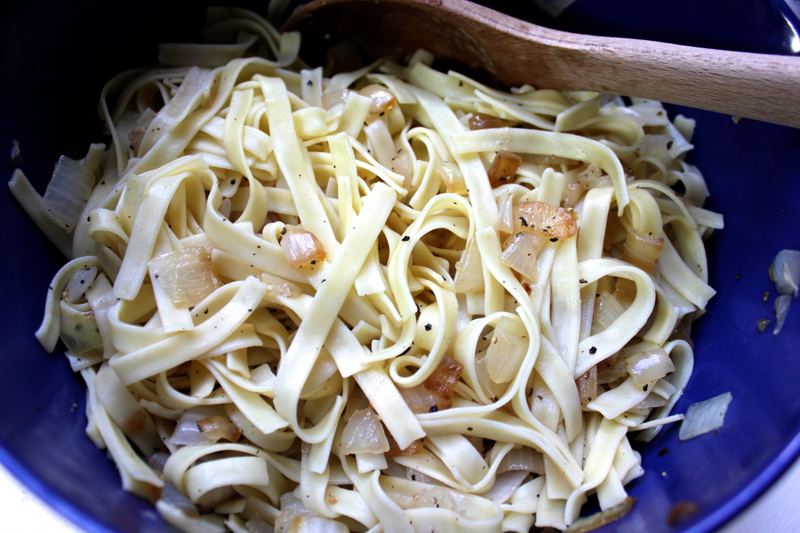 Preheat your oven to 350º F. Put the noodles and the onions, and 1 tablespoon of vegetable oil, in a large mixing bowl. Season the noodles with salt and pepper, stir, and taste the mixture. If you over-pepper like I did, you can rinse a portion of the noodles in a colander and then add them back to the main bowl. 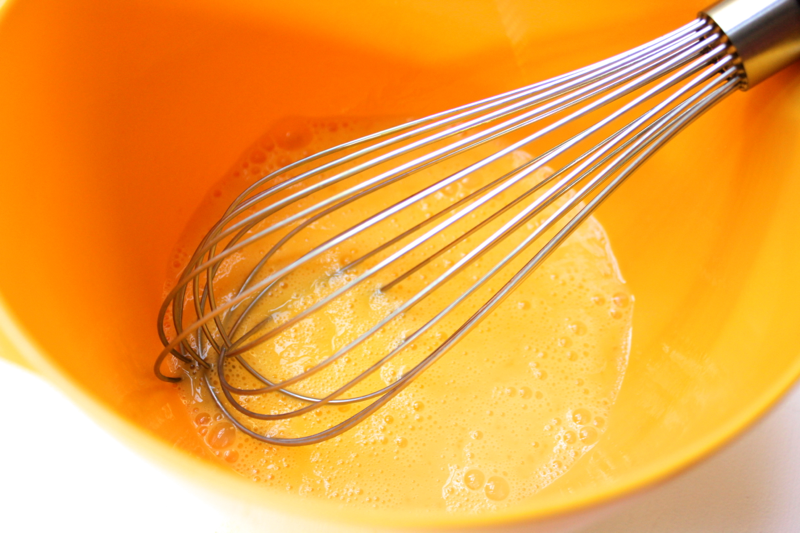 Once the noodle mixture tastes good, whisk 4 eggs, and stir them into the noodles. Lightly grease a large baking dish, and pour in the noodles, shaping them into an even layer. Bake the kugel for approximately 40 minutes, rotating the pan around half way through for even browning. 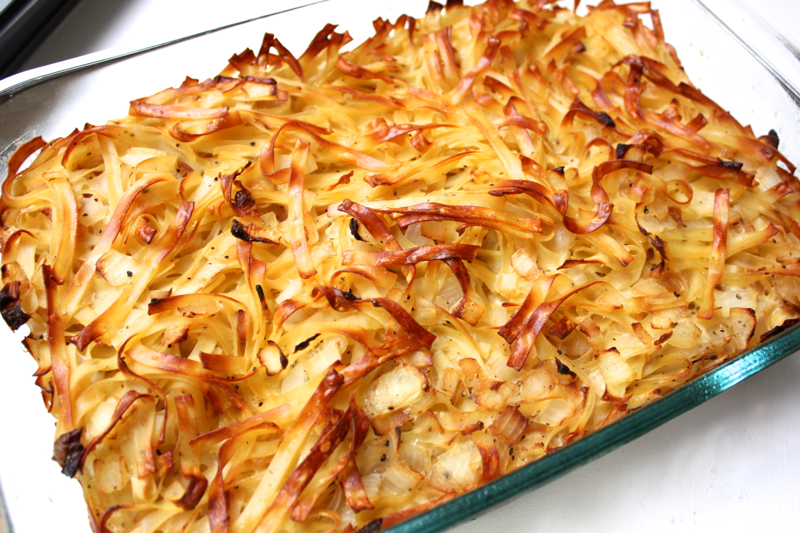 The kugel is done when you have those glorious crispy noodles all over the top. 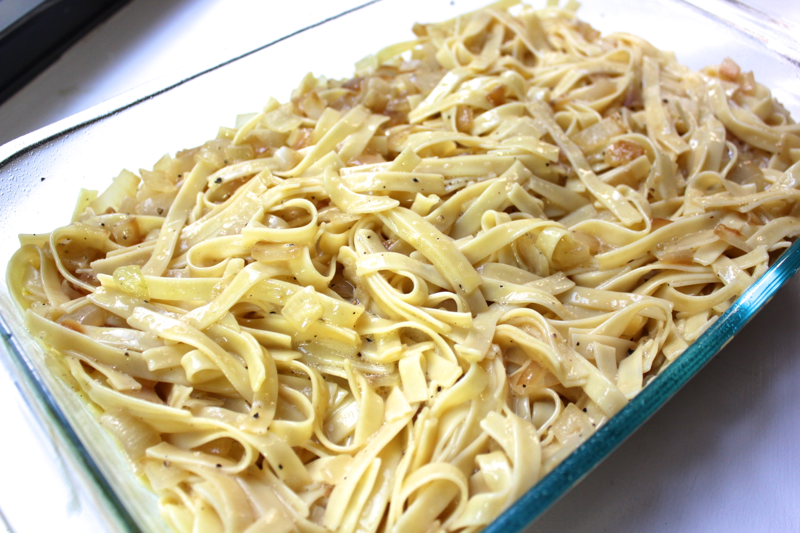 Cut the kugel into individual portions, and dole it out to enjoy. I love having some of this kugel leftover because it reheats to its full crispy glory in the oven, and then I can peel it to pieces and really enjoy it when no one else is watching. This is very close to my grandmother’s recipe (although she never really had a “recipe”… just “some of this and some of that.”) I have always loved it. She would add about one teaspoon of vanilla to it. Not enough to say “oooh, vanilla,” but just enough to add an unusual “what is that wonderful taste?” comment. 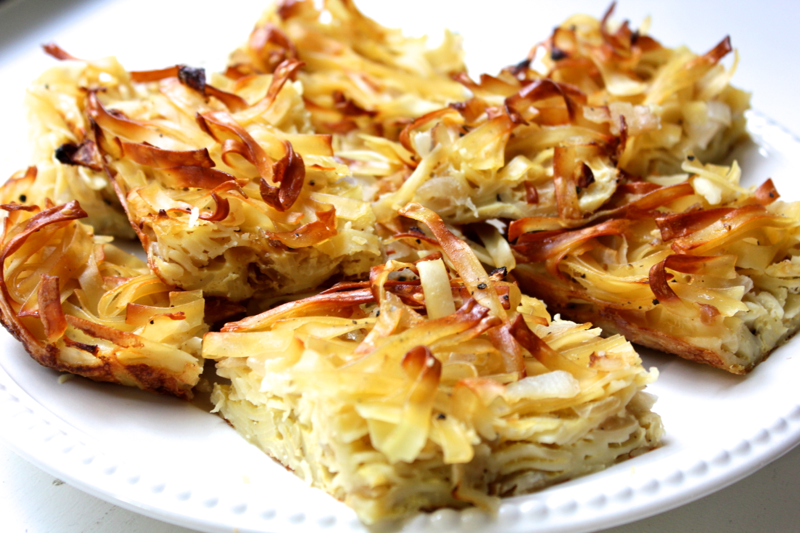 This is so much better than the sweet-type of noodle kugel.